Lynda Teller Pete with her weaving loom near Mile High Stadium, a few blocks from where she lives in Denver, CO.
My sister Barbara and I are fifth-generation Navajo weavers from the Newcomb and Two Grey Hills areas of the Navajo Nation. We grew up weaving Two Grey Hills tapestries, taught by our mother Ruth Teller, and our sister Rosann Teller Lee. We continue this weaving tradition with Barbara’s two children, Sierra and Michael Ornelas and granddaughter, Roxanne Lee. We are only one Navajo weaving family out of thousands on the Navajo Nation. Two Grey Hills is an area in northwest New Mexico, home of the Two Grey Hills Trading Post, over a century old, and one of the few remaining historic posts on the Navajo Reservation. In the past, these rugs and tapestries were mostly hand-spun wool from the fleece of local sheep in shades of gray, brown, black and white. My father, Sam K. Teller was a trader at this store for over 35 years. His broad wealth of experience and knowledge of weaving helped sustain and increase the fine reputation that regional weavers (including his family) gained as these rugs and tapestries became highly collectable and treasured. In our family, we regard weaving as our life’s work; weaving represents our connection to the universe. It is our stories, our prayers, and our songs, told, chanted, sung and preserved in the weaving motions. Every weaver has stories to tell about their weaving and every weaving has stories to tell about the weaver. Each weaving is unique: the sights, the sounds, the smells, and the signature style. I touch tapestries woven by my grandmother, mother, and sisters and I see their hands strumming the warps, I see tears, fears, joy, and I hear laughter and soothing words of comfort and congratulatory cheers. Unlike our elder Navajo weavers, people will know our names, they will see our faces, know our stories, and hear our songs and prayers on each tapestry that we create. Our paternal grandmother Nellie Peshlakai Teller (1899-1965) was a rancher, shepherdess, gardener, mother, grandmother, Yeibichai dancer, and weaver. She wove many styles, mostly in twill; she made blankets and rugs for her family and she wove pictorials for the market. In her pictorials she wove what she saw, Wrigley’s gum wrappers, Calumet Baking Powder’s chief head, the big red T in the Texaco sign, and many other icons. Our paternal grandfather, Paul Teller would sometimes work for the local trading post at Whiterock, NM and could have easily been asked to have his wife weave certain things for the tourist market, including weavings with ceremonial themes--but she never did. Because of her economic situation, she had a choice about what she wove and for whom. A great many Navajo weavers did not have a choice. What kind of weaver would make a decision to weave sacred ceremonial dancers, animals, and icons into their weaving for the market? A weaver that needs to feed, clothe and care for his or her family. A weaver might have been asked or encouraged by a trader to weave a Yei rug. The weaver may have asked for prayers from a medicine man for protection before the rug is started, and after a rug is finished, perhaps, a Hozhoojí might have been held to restore the weaver back in the hózhó way. Hózhó is our way of life. To live our life in balance, we do not separate the arts, culture, religion/spirituality, daily life, or our connection to the earth. It’s a way for us to live in balance. When we have this, we are well-balanced. The depiction of the corn in Mount Holyoke’s Yei rug, reflects this. The corn requires four things as well, fertile soil, air, water, and the sun. The corn is in hózhó. In any aspect, if there are disruptions in a Navajo’s life, a Hozhoojí has to be performed to restore our hózhó. The ceremony is a creation story renewal, our Holy People, the Diyin Dine’e’ are called upon to restore harmony. Pete weaving in the Canyon de Chelly, AZ in September 2015. She and her sister host weaving classes in the Canyon for a tour company called Loom Dancer Weaving Odysseys. Spider Woman is one of our Diyin Dine’é, she wove a map of the universe and the patterns of stars in the night sky and she gave us the gift of weaving. It is told to us that when Spider Woman was instructed to weave the map, it was her quest for knowledge, to go beyond her talents and stamina to weave the universe and she passed on her knowledge of weaving. From her gifts each weaver has these qualities. She is our grandmother, our teacher, and motivator. We regard our maternal and paternal grandparents as Spider Woman. Our mothers, our aunts, and our sisters and the weaving males are Spider Woman. Spider Woman instilled some weavers to be fearless; to take on challenges, to not only weave rugs to provide for their families, but to pass on knowledge, even if disruptions could occur. This Yei weaver is Spider Woman. In the weaving, some colors may have been changed deliberately; faces may be woven in the wrong direction, small changes may have been made for protection, to keep the hózhó. If the weaver is a woman and she is pregnant, she probably did not weave in the eyes, as that is a taboo that most pictorial weavers will never cross. She may not even attempt a Yei, a sandpainting or any other pictorial that depicts sacred people, animals, or icons as it may cause harm to her baby.I have attended many Navajo weaving conferences where I’ve met elder master weavers--some of whom have passed on--and listened to their stories. There are similarities between them, but their personal challenges make for stories that you want to listen to over and over. The youngest weaver at the conference was eight years old and she brought the adorable rugs that she had made hoping to sell her first weaving. The oldest weavers were a pair of sisters in their nineties. After they introduced themselves, they apologized for attending the conference because they no longer wove. They said they wove all their lives, but their failing eyesight was preventing them from weaving. They loved being a part of the conference and wanted to share something with us. Someone brought them a shoebox for a hand drum and a pencil as a drumstick and they sang their weaving song. Detail of a Yeibichai weaving showing the spiritline, visible in the upper right corner. 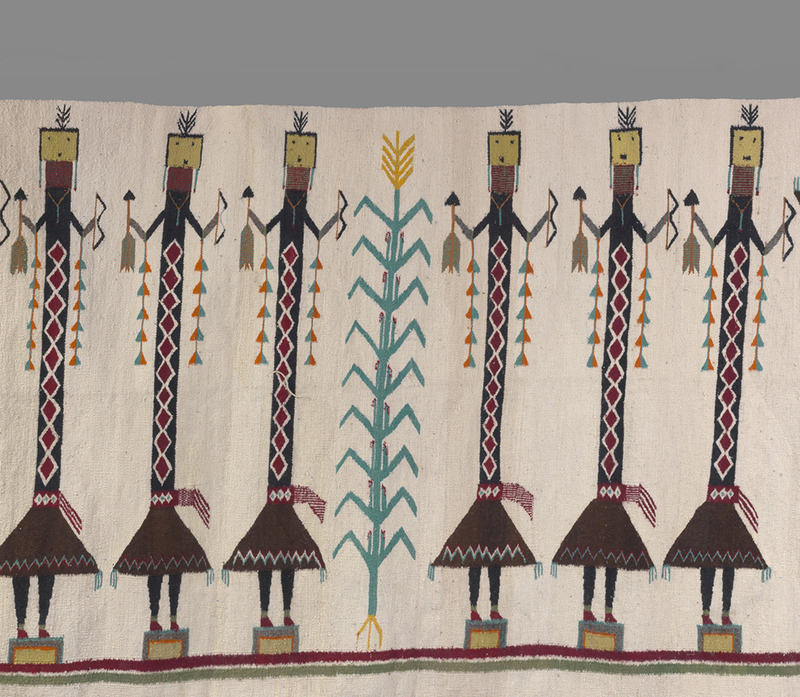 This work is part of the exhibition Dancers of the Nightway: Ceremonial Imagery in Navajo Weaving. From the Collection of Rebecca and Jean-Paul Valette. Photo Credit: Christopher Soldt. For three years now, my sister Barbara and I have done a Navajo weaving class in Canyon De Chelly, where we meet other Navajo weavers We are amazed by how much we learn from each other. One topic that recently came up is the spirit line. All of the publications on Navajo weaving represent viewpoints from non-Navajos and non-weavers. When a solitary Navajo weaver is interviewed, there is much lost in the translation. Interviewing one weaver and putting the highlights in a publication makes it seem like it’s a universal Navajo thought or viewpoint when in fact, every Navajo weaver is different. I think there is so much more about Navajo weaving that has never been told. Lynda Teller Pete has won several textile awards, most recently, the Best of Division and Best of Classification at the 2011 and Best of Division again in 2013 Santa Fe Indian Market. Pete is currently working on a collaborative book project including a portion on the Teller family weavers (due out in late 2016) with the Denver Museum of Nature and Science. The sisters will be appear in a 2016 segment of PBS’s Craft in America in an episode titled, “Teachers”. Below, her first entry to a juried weaving show in Santa Fe in 2004, for which she won first place.